So the lack of empirical evidence for Darwin's notion of slow, incremental evolutionary change demonstrated in the Cambrian explosion, while significant in itself, may not be as devastating as the deeper doubt he expressed to Graham nine months before his death. What a sad note upon which to conclude one's life -- in the end, his own theory negated itself! The epistemological nihilism inherent in Darwin's theory ultimately becomes the refutation of every Darwinist. If we are the chance products of Darwin's undirected processes from our purported ape-like ancestors, what possible convictions could any of us have regarding our own "certainties"? Others before me have noted the self-refuting nature of Darwinism, but it is worth remembering that the Cambrian explosion wasn't Darwin's only doubt. Intellects governed by Darwin's "law of higgledy-piggledy," as the great astronomer John Herschel once called it, cannot speak with much conviction about anything. 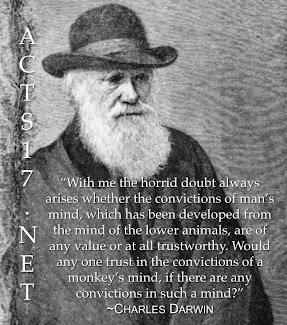 In a "higgledy-piggledy" world, what are the standards of objective truth for the "convictions of a monkey's mind"? the evolutionist always says that a watch need a designer because it cant self rplicat but organisem do self replicat and has dna so they can evolve. but according to this claim: if we will find a self replicat watch(with dna) we need to say that is made by itself .but we know that even a watch that self replicat itself is evidence for design. and we know that a motor is evidence for design. even if its very small and made of organic material. the evolutionist claim that small steps for milions years become a big steps. but according to this a lots of small steps in self replicat car (with dna) will evolve into a airplan. evolutionist claim that common similarity is evidence for common descent. but according to this 2 similar (self replicat) car are evolve from each other and not made by designer. and we even share 50% with banana!